I love love love this 3.1 Phillip Lim leather jacket, the zip-off waistband is just too cool for words. Which is why I thought it was so cool that he did a modified version of this jacket in organic cotton for his Go Green Go line of eco-friendly clothes for Barneys. This way, even the vegan kids can join in on the awesome jacket party. The cool thing is that it's not only earth friendly, but the organic cotton slashes the price in half! Save the earth and save your pocket! 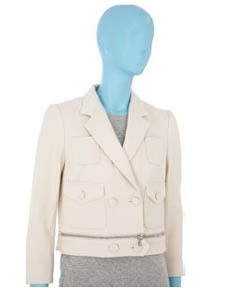 Organic Cotton Jacket by Go Green Go by Phillip Lim available at Barneys. i have the leather....love love love it.